LADAKH, India, Sep 24 2013 (IPS) - The Ladakh of today is a different world from the one Skarma Namgiyal remembers as a child. Back then, he had taken for granted the breathtaking beauty of its landscape, the purity of the cold mountain air, and the sweet taste of water in its streams. Today, at 47 years of age, this resident of Tukcha village in Leh district in the north of Kashmir cannot believe they are digging borewells for water, using water to flush toilets in their homes in place of the dry toilets they had been accustomed to, and having to cope with sewage flowing right up to their houses. Climate change, booming tourism and modern practices are wreaking havoc in this high altitude cold desert in India’s Jammu and Kashmir state. The average elevation in Ladakh is 11,000 ft above sea level and temperatures swing between minus 35 degrees Celsius in winters to 35 degrees in summer. Annual rainfall in the region is less than four inches. Earlier, water from the melting glaciers would be enough to cater to the needs of the locals, Namgiyal tells IPS. But with less snowfall and warmer summers, some of the glaciers have vanished altogether while others too are fast melting. GERES India, the Indian wing of the Paris-based environmental organisation, had in 2009 done a baseline survey of Ladakh, based on an analysis of meteorological data from 1973 to 2008 and interviews with older villagers. Its results showed glacial retreat in every part of Ladakh, most notably in Khardongla and Stok Kangri, the first north of Leh and the latter to its southwest. “Trend analysis clearly indicated a rise of the order of nearly one degree Celsius for all winter months,” says the survey. “Snowfall and rainfall too have showed a decreasing trend in the studied period,” Tundup Angmo, under whose guidance the survey was carried out, tells IPS. Kushu has another barometer for gauging the hotter summer. “Now you can see people using refrigerators and ceiling fans in their homes,” he says. Ladakh itself has a population of 280,000, according to the 2011 census. In addition, tourist arrivals have vastly increased from the trickle that began when the Indian government first opened the region to tourism in 1974. According to figures with the state tourism department, Leh had received 100,179 tourists by the end of August 2013. “The number of arrivals has been less this year because of the increase in air fares,” Mehboob Ali, assistant director for tourism in the Ladakh region, tells IPS. 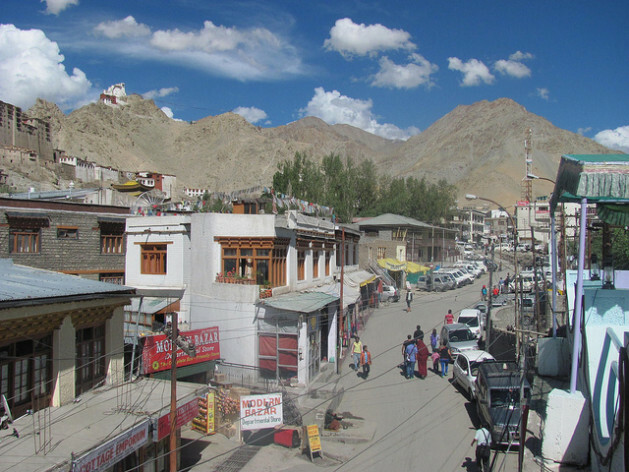 To cater to its visitors, Leh has 511 hotels and guest houses. “It is growing very fast,” says Lobzang Sultim, executive director of the environmental NGO Ladakh Ecological Development Group (LEDeG). LEDeG is conducting a survey titled Urban Water Health Project which was started in October 2012 and will end by March 2014. According to the initial findings of the survey, 375 hotels in the town are extracting 852,000 litres of water a day. Sultim also says that almost 60 percent of Leh’s 20,000 households are using borewells to draw water. “We have no choice but to draw water from borewells as the piped water supply is available for just one hour in the morning,” Manav Thakur, the general manager at Hotel Lingzi in Leh, tells IPS. All this is putting pressure on Ladakh’s already scarce water resources, and with no means to replenish them, the water table is falling rapidly. LEDeG is working on means to conserve water and regenerate groundwater resources. “We are planning a project in which we will divert some of the surface water and allow it to travel slowly to ensure seepage of water to the water table,” says Sultim. Another negative trend that is straining Ladakh’s water resources is the replacement of traditional dry toilets with water flush toilets. All of Leh’s hotels and guest houses have water flush toilets now, though a few also have dry toilets. A few households too have installed water flush toilets. Dechen Chosto, a housewife in Leh town, is not one of them; her family is happy using a dry toilet. “They need no water, don’t stink and the compost can be used in our agricultural fields,” Chosto tells IPS. Dry toilets, indeed, are ideally suited for Ladakh’s cold climate, says Sultim. “They are easy to use in the winter here when everything else except the blood in the body freezes,” he adds. “We cannot afford the luxury of water flush toilets,” says Tashi Tundup, an executive engineer in the public health engineering department in Leh. “Though I am all for change and want people to benefit from modern facilities, I am a strong votary of continuing with dry toilets in Leh,” he tells IPS. Leh had so far not felt the need for a sewage system. However, with the growing number of hotels and guesthouses, sewage and waste from these establishments is flowing right into people’s backyards and even into the Leh stream which runs through the town. The organisation is now planning to publish posters and pamphlets to spread awareness about continuing with traditional practices.